Polyjacking.com offers concrete leveling services to the commercial property owners in Nebraska to keep your concrete and foundation safe and stable. Some of the common concrete problems that can happen around your Nebraska businesses are concrete spalling, heaving, cracking, crazing, shrinking, scaling, and discoloration. You can click on those links to learn more about these problems for your concrete. For whatever commercial concrete problem you have, the experts at Polyjacking.com have the solutions for you. The concrete leveling method used by Polyjacking.com is called polyjacking. 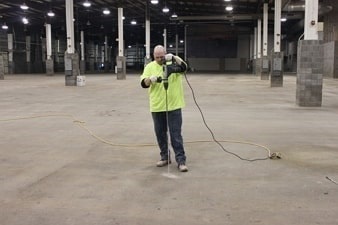 This process utilizes polyurethane injection to lift and stabilize the affected slab. Once the polyurethane is injected, the slab is once again ready for use, usually within 15 minutes after injection. There are lots of advantages to choosing our polyurethane injection polyjacking method for your concrete lifting needs. Polyjacking is much less expensive than other methods since it does not involve completely removing the old concrete and replacing it with a new slab. Our specially trained teams and specific procedures allow us to accurately control the lift of your slab within 10/100th of an inch. Due to the fast curing time of our polyjacking process, the slab is ready for normal use within 15 minutes after injection. This leads to more efficient repairs and less hassle. Our process is relatively simple and requires minimal equipment, making it fairly non-invasive. The expansion of the foam allows it to completely fill nooks and crannies for effective lift and support. The polyurethane foam material used by Polyjacking.com is extremely durable and has a high tensile strength, making for long-lasting and sturdy repairs. Our special foam blend is designed to repel water without being compromised and acts as a barrier against troublesome moisture. Polyjacking can be used to repair a wide variety of concrete slabs in industrial and commercial situations. The expert team at Polyjacking.com has the required technology and experience to ensure that your concrete slab is properly repaired. We strive to satisfy you, and your satisfaction is important to us. For this reason, we provide only the best for all of your concrete lifting needs. For all of your concrete repair needs, contact	Polyjacking.com today!